"This is our home, Megatron. We will STAY. We will FIGHT. And... we will WIN." Well, Hasbro isn't one not to capitalize on fiction. So when the highly anticipated War for Cybertron game came out, Hasbro of course couldn't resist releasing several toys for the occasion. Naturally, instead of making a toy for Trypticon or Breakdown, they made yet another Optimus Prime. To be fair, though, in the video game itself, Optimus Prime looks totally fantastic. In the trailer, when Optimus charges at the horde of Decepticons, brandishing a double-bladed glowing battle axe and literally hacking bits off Decepticons... well, the game might be a wee bit overratted, but it's awesome nevertheless. But I'm not here to talk about the game itself. Not today, anyway. I've never planned to get this toy, frankly. But when I asked a relative to ship the first wave of Generations toys from Toys'R'Us (Drift and Thrust), the guys at Toys'R'Us apparently receive WFC toys among the first wave and plopped in WFC Optimus Prime and Bumblebee as well. So I had to pay for four Deluxe Class toys when I only wanted two. Bumblebee I gave away to a cousin because he looked so squat even without opening the box, but Optimus Prime somehow found his way to my display case and there it stays. So... Optimus Prime. In the game story, Optimus Prime wasn't a data clerk or a dockworker or anything like that. In the beginning he was already a squad leader working with Ratchet, and was already named 'Optimus Prime'. When Megatron's Decepticons assaulted Iacon and seemingly murdered Zeta Prime, Optimus became de facto leader of the Autobots. During the aftermath of Zeta Prime's seeming murder, the Decepticon forces razed Iacon. Optimus Prime managed to round up the survivors and whatnot, and defeat several war machines as well as Decepticon general Starscream. Depending on Hasbro's mood on the day, the Optimus Prime of War for Cybertron may or may not be the same Optimus Prime in the upcoming TV series Transformers: Prime. The name Optimus Prime has been used in every single continuity as the main protagonist/Autobot leader. Optimus Prime transforms into... well, a Cybertronian thingy. It's sort of a cross between a train and a truck, with sleek-ish curves. It's not as wide as I would've liked. After all, in the game the impression of driving around with Optimus Prime is like controlling a tank, but without the turret and with wheels. Meanwhile, the toy brings it in a form that's a little too streamlined for my tastes. But it looks close enough, and is a passable interpretation of the game design. It looks like what a truck would look like if it's designed to be in space and is capable of reaching high speeds. The angled exhaust ports and painted windows are there just to show that this is the same Optimus Prime we know and love. Compared to all the other pre-Earth designs that G1 Optimus Prime had, this is the one that looks the most like a Cybertronian truck. The Marvel comics alternate from 'box with a gun on top' and a white coloured version of Prime's Earthen truck mode. War Within had a nice design, but it's a wee bit too bulky and military for my liking. This design seems to incorporate elements from War Within and the abandoned TransTech series. He's mainly red in front and a mixture of blue and gray for the back half. 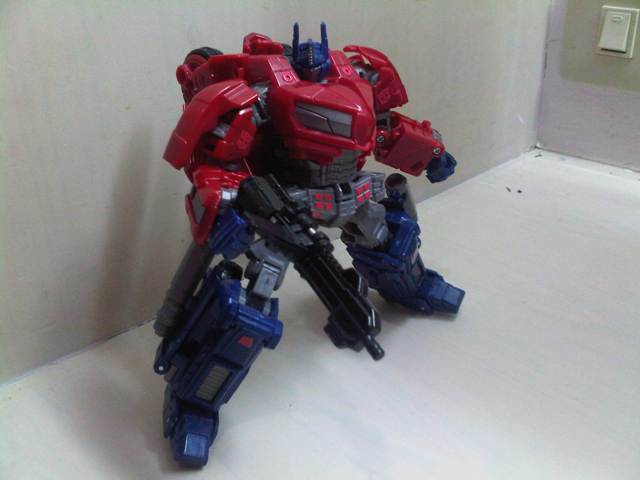 However, his red is a little darker compared to most other Optimus Primes, closer to blood-red than to vermillion. Black, silver and pale red decorate the wheels, grilles and all those other details. Actually, I would've preferred a 'damaged' or metallic finish than the almost-glittery paint scheme we have here. After all, in WFC all the vehicles were pitted and torn apart with battle damage. As it is, Optimus looks like he has just came out from a showroom. 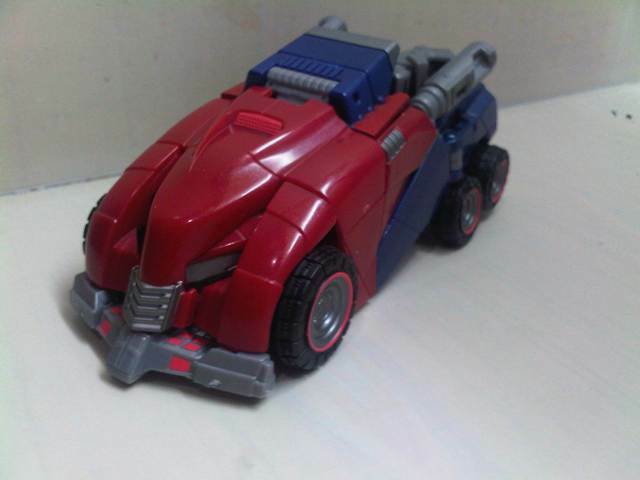 Optimus looks fine from the front with the glimmery red paint, but from the back it's a wee bit shabby. The blue bits are there, of course, but instead of the whole chunk behind the 'cab' being blue, like it was in the game, Optimus' gray thighs stick out like a sore thumb without any attempt at hiding it. Oh, and you could plug the included rifle on top of the gray bits, but it looks stupid and is better left ignored. The instruction neglect to mention that you have to flip the knee-guards out to form Optimus' tail-lights, though. He rolls pretty well on the ground on his six wheels provided all the bits fit properly during transformation. The exhaust ports/vents can move up and down a bit, but that's about all you could do with the alternate mode. Ah, well... while most ground-based Cybertronian alternate modes are hit-and-miss, and this one is a rather nice-looking one. Optimus Prime's transformation is horribly, unnecessarily complex. This is a prime example (no puns intended) of a complicated yet terrible transformation. The pieces and fiddly bits are a pain to manipulate. It's kind of like Classics Galvatron � an overcomplicated and messy transformation that ends up with a toy that probably won't be transformed ever again. I mean, the alternate mode is not worth the effort of transforming him. Regrettably it's a problem common with the war for Cybertron toys. If adults get frustrated transforming them, what chance do little kiddies have? But transformation aside, Optimus Prime's robot mode is a satisfying rendition of the CG model in the video game. There are some quibbles in the toy's appearance, though. Firstly, the hood kibble hanging from his back is visible from the front, giving the impression that Prime's added some pounds on the stomach. The shoulders are also placed too low for my tastes, and are forced to remain that way due to kibble blocking the way. Optimus Prime is mainly based on his original G1 body, what with the red from the waist up, blue lower feet and hands, gray thighs and blue face formula, but incorporates hints and clues from his myriad designs. For example, the two wheels on his back is inspired by TransTech (which also inspired the alternate mode somewhat) and the angled chest windows are very similar to his Animated counterpart. His head is the Optimus Prime we all know and love, but the antennae are a wee bit sharper and longer. Makes him look a bit like the Batman. Also, engraved onto his back (under the kibble) is one of those ancient Autobot symbols seen in the old cartoon, and more recently in Dreamwave's stuff. A nice little touch. All in all as a display piece it looks okay. Not especially good, but okay. In my opinion they should have included the gigantic battle axe he uses as a melee weapon. But hey, at least he got a gun, right? However, articulation-wise he has some problems. There are multiple ratchet and swivel joints all over Optimus' body, more than that a normal Deluxe class toy would have, but most of the times the large pieces of kibble get in the way of posing. For example, the shoulders are frustrating to manipulate, since if you move the hands one way the kibble stuck on the shoulders would move in a different direction. It's irritating. The thighs are restricted from moving too much by the waist guard. The tab holding Optimus Prime's crotch/six-pack (his grille stomach) bit and his stomach/waists bit also comes off rather easily. Also, the rather compact design also limits the number of balanced poses that Optimus can handle. The rather thin blaster rifle included could be pegged on Optimus' fists, or onto the holes on his wrists a la G1 Megatron's fusion cannon. It seems that the designers couldn't decide whether to emulate Optimus Prime's trademark ion cannon (or its latest incarnation in the game), or the neutron assault rifle that Primme parades in front of the WFC case, so they hybridized the two designs to create this lanky weapon. Looks like a machinegun of sorts, what with the ammo clip hanging from the side. It has a loooong handle, though, so Optimus wouldn't be worried that his weapon might drop off during battle. There's a feature that allows you to bend the long gun into a smaller gun, which spring-loads back into the longer gun again. Frankly, this gimmick's pointless. Overall, though, it's a mediocre robot mode, faulted by the designers trying to over-complicate the transformation. There's nothing about him that screams "BUY ME!" when you could have gotten several different Optimus Primes with better design and accessories. Transformation Design: 2/10 As I have said over and over again, Optimus Prime's transformation is over-complicated for a toy his size. Too many parts that hardly holds together, and the resulting transformation is frustrating. Transformation should be the fun part of a toy, not to frustrate somebody. Durability: 7/10 The plastic seems flimsy on some parts, like the hood analog. The silver paint might also scratch off. The thigh joints are worryingly loose as well. Otherwise, though, it's quite solid. Aesthetics: 7/10 The alternate mode is too long compared to how it was in the video game, but the robot mode looks fine. In an ideal world he would've had battle damage. Provided you're not too choosy about poses, he could serve as a decent display piece, though. Articulation: 6/10 Comparing him with deluxe class toys from the same wave � namely Drift and Thrust � Optimus Prime has more points of articulation. However, his bulky shoulders restrict many of these, so he can't really get a high score. Fun: 4/10 The overcomplicated transformation and the limited articulation robs Optimus Prime from much play value. Price/Value 3/10 I feel that with the price I'm paying, they should've put a little bit more work in this. Come on, theyhave shown that they could do great things if they wanted to do so. Overall: 3.5/10 Not particularly bad per se, but I still feel robbed. It's a shame that the War for Cybertron toys are so unwieldy. With a little more work before releasing them, the WFC toys might've had better transformation and more useful articulation. There isn't much to set this apart from the other Optimus Primes out there, or even among his own Generations wave-mates. As it is, though, this isn't a toy that I would recommend.